The 2017 season is finally underway! The Jan 28th double header was an event not to be missed, if crowd size and volume was any indication. With 21 new or returning draftees, vets ready to shine after an all-too-long off season and superfans and jeerleaders dressed to impress, the vibe at the temple was absolutely electric! 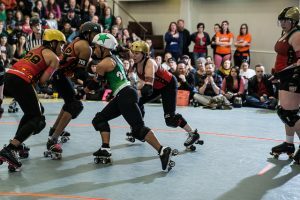 We saw swinging collisions, apex jumps and fancy spins from jammers and blockers alike. There were nail biting lead changes and beautiful scoring runs. If you weren’t there, you missed out! Luckily, our very own AbracaJabYa is here with the next best thing: bout recaps. The opening game of 2017 put us on the edges of our seats through a slew of power jams, killer offense, rock solid defensive walls, and a 2nd half comeback. 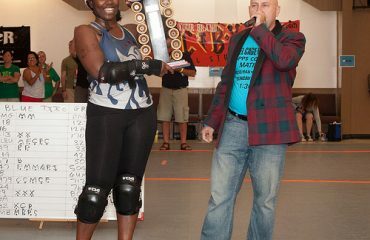 Last year, the Toxic Shocks finished in 2nd place in the home team championship, with the Sake Tuyas taking 3rd. The Sakes started 2017 off strong, with a string of successful jams in the first half that brought them to an undisputed head. 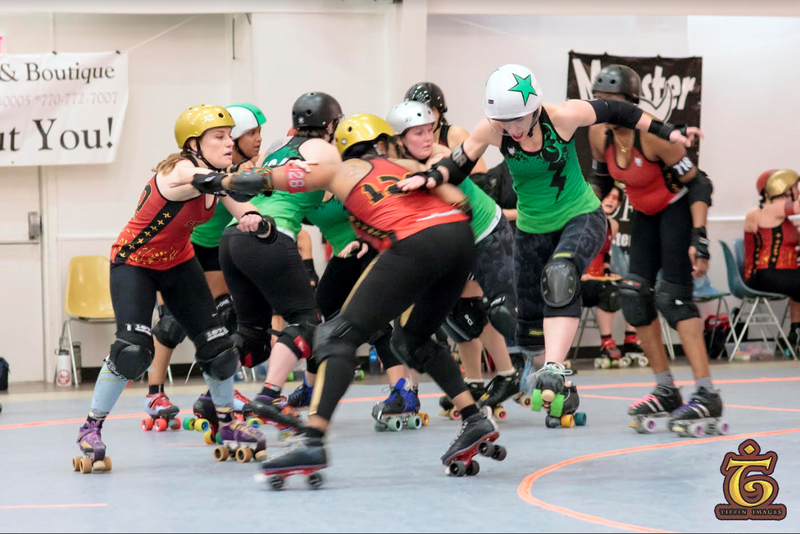 The opening jams saw multiple back-to-back jammer penalties, tightening the tension as the Sakes succeeded in 20 and 19 point power jams. The Shocks had some hope with a 26 point jam that attempted to bridge the widening score gap. However, the Sakes wrapped up the first half with a 114-80 lead. 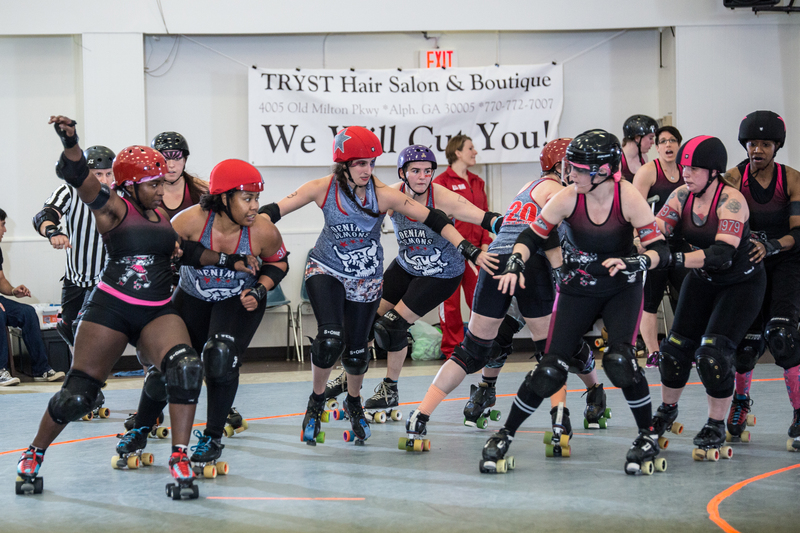 The second bout of 2017 was a nail-biting battle featuring the Apocalypstix, last year’s Home Team Champions, fighting to maintain an early won lead against the equally spirited Denim Demons, who took 4th place in 2016. The game opened with an 8-0 lead for the Demons, who kept their points with skilled defense. However, steady point increases and a Stix power jam brought the score to 28-8 Stix. Despite some coordinated offense and defense power from Demons blockers, the Stix maintained their lead 52-17. 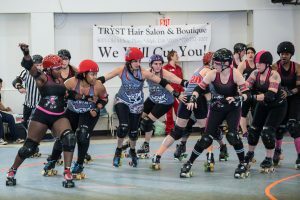 Demons’ jammers were often lead over the next few jams, thinning the gap to 56-29 Stix; however, strong Stix defensive work along with quick jamming brought the Stix to an even higher 73-31 lead. Demons fought back, bringing the game to a near tie with 88-70 at the half. The Stix started the 2nd half with the lead, but the Demons weren’t done: both teams fought head to head for points, including a 10 point power jam for the Stix. The Stix continued to pile on the points up to the final jam, finishing the game with a 179-130 victory. Join us this month as we open our Interleague season, when our Jukes of Hazzard take on the Muscogee in the annual Rookie Expo, then our all-stars and Rumble Bs split up school yard style in our Red vs Blue showcase. Keep your eyes peeled for an upcoming blog post about our fresh 2017 charters, or see them for yourself Feb 18th! We hope to see you there!